ELHistSoc -The Church that became the "Pottery". The Church that became the "Pottery". This article originally appeared in the 27th Annual Tri-State Pottery Festtival Plate Turners Handbook, June 16, 17, 18, 1994. One of the earliest English potters to settle west of the Allegheny Mountains in Pennsylvania was Jabez Vodrey and his family from Staffordshire, England. As early as 1827 Mr. Vodrey along with a man by the name of Frost opened a pottery in Pittsburgh, Pa. making Rockingham and Yellow Ware. They made pitchers, bowls and dishes. Sarah Nixon Vodrey, Jabez' wife was the decorator. The Vodrey and Frost Pottery was consid-ered the first commercial pottery west of the Alleghenies. By 1830 the Vodrey family had moved from Pittsburg to Louisville, Ky. where Mr. Vodrey continued in the pottery Busi-ness. Later Mr. Frost joined him in the business . 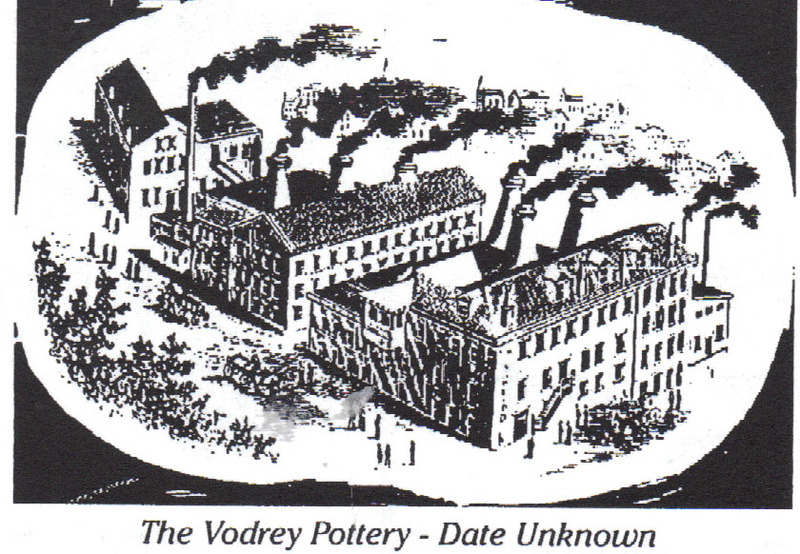 In 1839 an opportunity to run a large pottery in Troy Indiana was provided for Mr. Vodrey. The family stayed there until 1847 when they moved to East Liverpool. Mr. Vodrey joined with-William Woodward in a small pottery on 4th Street that was destroyed by fire in 1848, Woodward, Vodrey along with two Blakely brothers began another pottery on 4th Street which was called the "Phoenix Pottery." They manufactured yellow ware, Rockingham and terra cotta. During the mid 1850's Mr. Vodrey retired from active pottery work. The Vodrey pottery was established in 1857 when the three sons of Jabez Vodrey, James. John and William started the "Palissy Works" at 4th and College Streets. They used the remains of the Catholic Church which had been burned in the 1840's as their first building. After the Civil War, they purchased additional land and increased the size of the pottery. As the pottery expanded they added to the production of Yellow Ware and Rockingham. In 1876 the company constructed new buildings and kilns and also began producing white ironstone. The company was incorporated in 1896. By the end of the century the pottery employed 225 workers. During the first quarter of the 20th Century, the firm added white granite ware, semi porcelain dinner sets, toilet ware and hotel china to their line. 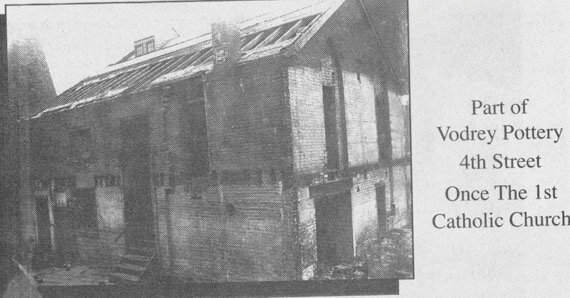 As times changed, the pottery suspended operations in 1928. 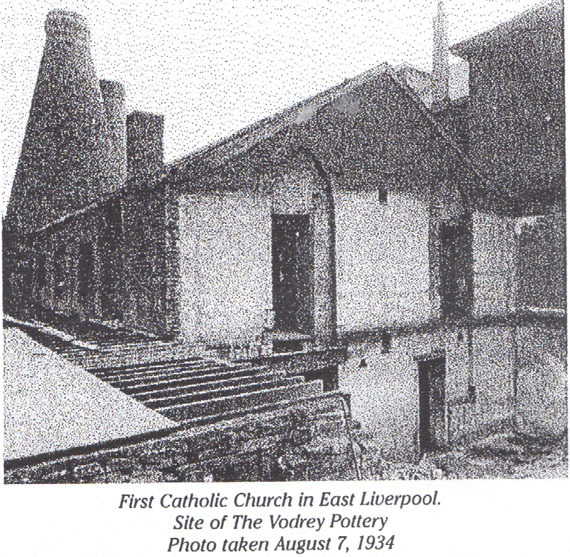 Many in the community were surprised to find the early remains of the first Catholic Church as the Vodrey Pottery buildings were torn down in the mid 1930's. The Church remains were decorated with red, white and blue bunting for the community's Centennial Celebration. Those buildings were torn down to make room for the Memorial Auditorium which opened in the mid 1940's. Not only did the Vodrey family become activity involved in the Pottery business, they also became actively involved in community affairs. William served as a Colonel in the Civil War serving with the 143rd Ohio Volunteers. His brother John was killed while serving with Sheridan on his march to the sea through Georgia. James remained at home and ran the pottery. William Vodrey married Elizabeth Jackman of Fredricktown on Christmas day in 1866. This branch of the family has continued to have a great interest in the village of Fredricktown. Through their efforts much of the early history of the community has been preserved. William and Elizabeth had 3 children, Oliver, William H. "Harry" and Mary. Oliver served many terms on the local school board. William H. entered the law profession and was called "Judge" by some of his peers as a matter of respect. He served many years as Trustee of Bethany College and was closely involved -with the Brush- Moore Newspapers which included the East Liverpool Review. Judge Vodrey is also remembered for the work he did in planting trees on barren land throughout the county. It was through his efforts also that the beaver was returned to this area after several years. During the 1930's Mary Vodrey Nease and William H. Vodrey, the 3rd, were instrumental in collecting examples of the early ceramic ware made in this community. This collection was the beginning of the fine collection which is now housed at the Museum of ceramics. 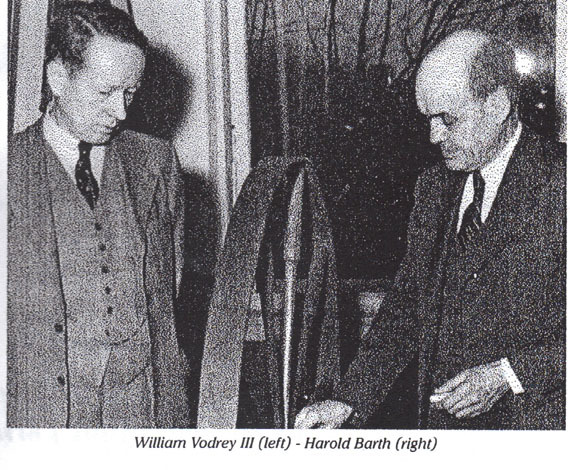 William H., the 3rd, was also noted for his collection of paintings by local artists and his research on them as well as his collection of other artifacts of our area. 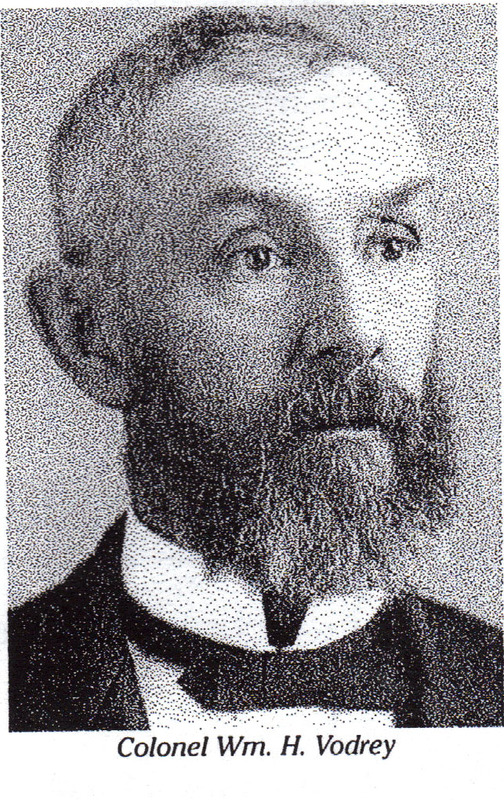 Certainly the name of William H. Vodrey has long been associated with the East Liverpool and State Historical societies. He served as Trustee of both organizations. He was Trustee of the Ohio Historical Society from 1958 -1975 and served as its President 1965 -1967. He was Treasurer of the East Liverpool Historical society from 1958 -1979. He along with historian Max Card published a book on the Sandy Beaver Canal. They are both remembered in May with the Annual Vodrey - Card Hike. Mr. Vodrey made a generous gift to the Ohio Historical Society so that the Museum of Ceramics could be completed. The family today continues the service and commitment to the preservation of the scenic and historic areas of Columbiana County.